Darrall Tucker Imhoff (October 11, 1938 – June 30, 2017) was an American professional basketball player. He spent 12 seasons in the National Basketball Association (NBA), playing for six teams from 1960 to 1972. He was an NBA All-Star and an Olympic Gold medalist. Darrall Imhoff was born October 11, 1938 to Clark and Lorraine (Tucker) Imhoff. He grew up in San Gabriel, California and attended Alhambra High School, Alhambra, California. After making the team as a walk-on at the University of California, Berkeley, Imhoff was a two-time All-American and was the top rebounder on the 1959 NCAA championship team and hit the winning basket with :17 remaining. He was the leading scorer and rebounder on the 1960 NCAA runner-up Berkeley team and was a member of the gold medal-winning 1960 Olympic basketball team. As a collegian, Imhoff was feared as a shot blocker, and was a respected rebounder who was the hub around which coach Pete Newell built his NCAA champion University of California team. The Golden Bears edged Jerry West's West Virginia University team in 1959, with Imhoff rated by some the best college player in the country. In 1960, leading the nation's top-rated defense from his center spot, the 6'10" 235-pounder led Cal back to the NCAA finals before losing to Jerry Lucas and Ohio State. He was a two-time First Team All-American and a member of Berkeley's Nu Chapter of Phi Kappa Tau fraternity. Imhoff was inducted into the Cal Athletic Hall of Fame in 1988 and enshrined in the Pac-10 Hall of Honor in 2005. His jersey at Cal (No. 40) was retired during a game between Cal and Stanford at Haas Pavilion on February 14, 2009. In 75 career games at Cal, Ihmoff averaged 10.0 points and 9.5 rebounds. Imhoff was a senior awaiting entry into the National Basketball Association in 1960 when Hall of Fame Coach Pete Newell, now the U.S. Olympic coach, added his prize player to the 1960 United States men's Olympic basketball team for the 1960 Olympic Games. Walt Bellamy and Imhoff saw action together as center and power-forward during the Rome Games, especially against the tall Russian team as the Americans usually jetted out to a big lead early and then rested their starters. The Olympic roster included Hall of Fame players Bellamy, Oscar Robertson, Jerry West, Jerry Lucas and Bob Boozer, among others. Imhoff averaged 4.8 points in the 8 games as the Team USA captured the Gold Medal. The entire 1960 United States men's Olympic basketball team and coaching staff was inducted into the Naismith Hall of Fame in 2011. Imhoff was the most highly publicized draft pick of the NBA that same year. The New York Knicks, picking third overall, made him their first pick, a move which generated much excitement for the team. The Knicks had two all-stars already, Richie Guerin and Willie Naulls, and looked for Imhoff to complete a potential contender in the league's largest city. Imhoff unfortunately, was not up to the pressure and had a season which fell well below hopes. Disappointed, he was the backup center by season's end. He was the starter in a March 1962 game when Philadelphia Warriors center Wilt Chamberlain set an NBA record scoring 100 points in a game. After the season, Imhoff was traded to the Detroit Pistons for their All-Star guard Gene Shue. Imhoff's lack of shooting skills at the NBA level had been exposed, but he never quit working to improve. He began to see more minutes with the Pistons until he was dealt to the Los Angeles Lakers in 1964. On a star-studded team that included Jerry West, Elgin Baylor and others, Imhoff was now a respected reserve. He contributed solidly to a team that won the NBA West and made it to the NBA Finals in 1965. The Lakers were encouraged enough to start Imhoff the next season, again winning their division, but were Finals runner-up again. 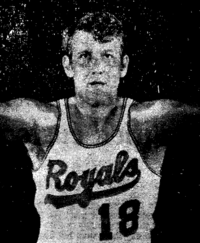 Finally, in the 1966–67 season, Imhoff hit some of his potential, averaging 12 points, 13 rebounds, 3 assists and 2 blocks per game as a Laker starter. He made the 1967 NBA All-Star team as a reserve. But he was still outplayed by Boston's Bill Russell in the NBA Finals, a fact which repeated itself in 1968. This fact spurred the Lakers to sign Wilt Chamberlain that year, and Imhoff was traded to Philadelphia where he was again a solid backup center and starter in the 1969–70 season. The 76ers were second in the East, but were knocked out by Boston and Russell again in the playoffs. Imhoff was a starter again for the 1969–70 campaign and Philadelphia made it to the playoffs before losing to Milwaukee and Lew Alcindor. He was traded to Cincinnati at the start of the 1970–71 season for 2 players and second round draft choice and became the starting center until he tore a cartilage and ACL and had surgery. He re-injured the knee again at the start of the next season and was put on waivers. Portland signed him to a new contract for the remainder of the 1971–72 season and finished his career at the end of Portland's bench in 1972. Imhoff retired with a bad knee and had surgery in January 1973 to repair his ACL. In 801 career NBA games, over twelve seasons, Imhoff averaged 7.2 points, 7.6 rebounds and 1.8 assists. After retiring Imhoff lived in Hillsboro, Oregon and Eugene, Oregon. He was the Vice President of Sales & Marketing at the United States Basketball Academy (USBA), a prestigious, internationally recognized basketball camp located in Oregon's McKenzie River Valley, about 45 miles east of Eugene prior to his retirement. He was also active in the Fellowship of Christian Athletes, the Providence Child Center and Rotary International. He was married to wife Susan and had three daughters, Karen, Diana and Nancy, and two sons, David and Robert. His daughter Nancy was inducted into the Idaho State University Sports Hall of Fame in 2005. Imhoff died on June 30, 2017, in Bend, Oregon of a heart attack. He was survived by his children, 18 grandchildren and three great-grandchildren. In 2005, Imhoff was enshrined in the Pac-10 Hall of Honor in 2005. His jersey at Cal (No. 40) was retired in 2009. The ceremony took place at the game between Cal and Stanford at Haas Pavilion on February 14, 2009. In 2011, the entire 1960 United States men's Olympic basketball team and coaching staff was inducted into the Naismith Hall of Fame. ^ a b c d "Darrall Imhoff Obituary, Bend, OR". www.bairdmortuaries.com. ^ "Darrall Imhoff College Stats". College Basketball at Sports-Reference.com. ^ "1960 United States Men's Olympic Basketball". Basketball-Reference.com. ^ a b "The Naismith Memorial Basketball Hall of Fame :: 1960 United States Olympic Team". www.hoophall.com. ^ "Darrall Imhoff Stats". Basketball-Reference.com. ^ Eggers, Kerry (September 3, 2008). "After final buzzer, Oregon's still home". The Portland Tribune. Retrieved April 1, 2009. ^ "Bengals to Induct Six into Sports Hall of Fame on Saturday". Idaho State University Athletics. This page was last edited on 7 February 2019, at 01:06 (UTC).